It's nearly Easter time and to celebrate we've got together a collection of the most amazing eggs around! 1. 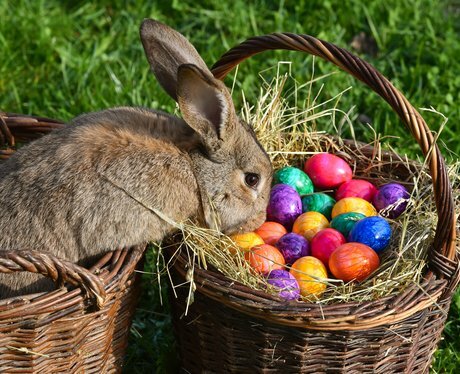 This bunny can't resist a little peek inside a basket full of colourful eggs. 2. Oooh la la! Now this is what we call "egg-cellent!" The stunning pink and gold egg with bejewelled lily of the valley flowers, was created by jeweller Peter Carl Faberge. The beautiful collection also includes nine imperial Easter eggs which were owned by none other than the Russian Tsars. 3. Can you name all four of these cultural landmarks? 4. Well it wouldn't be Easter without an appearance from the Easter bunny! 5. Arts and crafts sessions are popular at Easter time. Will you be decorating eggs this Bank Holiday? 6. These lovely eggs were created using a special wax technique which makes the colour stick. 7. A different take on Easter: we love these wooden Easter bunnies clutching wooden carrots. 8. Easter is the time to get messy, so why not grab some paints and dive right in? 9. A fountain in Baden-Wuerttemberg is decorated with around 11,000 hand painted eggs each year! 10. Surprise! This chick sits in pride of place in the middle of a stunning glass egg. 11. These hand painted eggs are definitely some of the prettiest we've seen. 12. Wow, that's a lot of flags! This giant egg in Schoenwald displays flags from around the world. 13. In Vienna eggs decorated with musical notes are strung up on ribbons. 14. A chocolate bunny and an egg...it's like the perfect Easter love story. 15. At a market in Schleife, Germany, people can go and watch "egg-sperts" decorate eggs. 16. A child looks delighted to find this giant Thomas the Tank Engine themed egg in London. 17. Pensioner Hannelore Horstmeyer created this beautiful display in her front garden! 18. A turkey egg is painted with a beautiful picture of a lamb. Perfect for Spring! 19. Egg collector Barbara Kruhoeffer shows off her metal eggs - part of her 5000 strong collection! 20. In Germany, around 10,000 eggs will be hung on the world famous Easter egg tree in Saalfeld.